While perusing the Sibley Guide to Trees (which I quote below) I ran across an amazing name for ginkgos: Stinkbomb Tree. The name is new to me but I know how they got it. 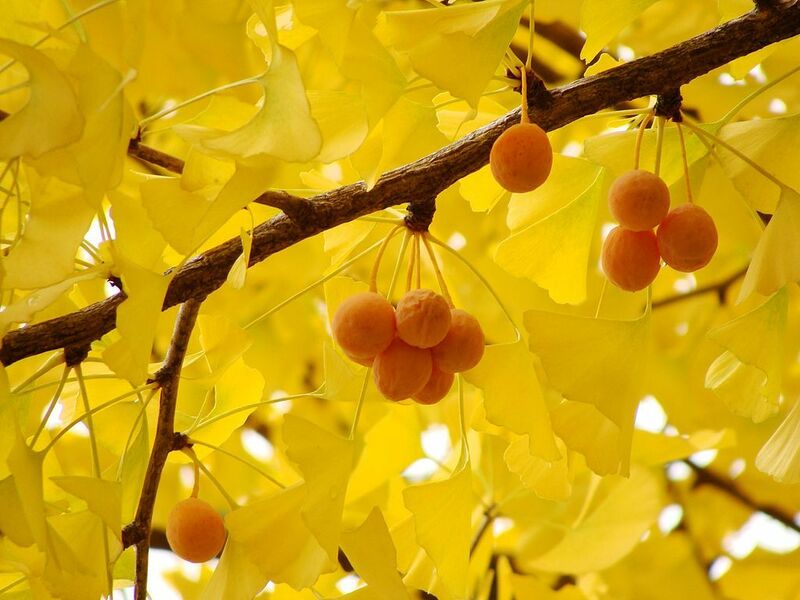 In autumn the ginkgo’s fleshy, ripe fruit falls from the female trees and is easily crushed underfoot. If you step on it you’re sorry. It’s slippery and smells like vomit. There are probably no wild ginkgos left on earth but they survived and re-naturalized in Asia because humans cultivated them for their religious and medicinal significance, especially in China. Ginkgos cope well with pollution and confined root systems so they’re often planted in cities. How hardy are they? Six ginkgo trees were the only living things to survive within a 1-2 km radius of the 1945 Hiroshima atomic blast. Of course that wasn’t known when they were chosen to beautify Pittsburgh during our Smoky City days. Both male and female trees were planted in our city parks in the late 1800s. Nowadays female ginkgos are often banned because of their “stinkbombs” but we have some on Schenley Drive near Phipps Conservatory and on Highland Drive near Highland Park. There were a number of ginko trees that lined a street near my office when I worked on Capitol Hill in Washington. Walking down the sidewalk was like running the gauntlet. There is nothing worst than trying to look professional while smelling like you stepped in dog doo! According to my Dad, ginkos were known as “pooberry trees” on University of Delaware campus. He didn’t mention anyone calling them stinkbomb trees. There are some near the pool at Riverview Park. Oh, yeah, there are a bunch near Phipps. I always thought they smelled like dirty stinky feet! Phew! I lived on D Street between 9th Street to 14th street NE growing up. Does anyone know where the trees were in the 40’s and 50’s. I remember them but not exactly where they were. Just curious.